The new MINI Hatchback is bursting with character and personality; it’s trendy good looks are one of its biggest selling points. It’s also great fun to drive and doesn’t cost much to run. The MINI has been revitalised since it was relaunched at the start of the new Millennium and the brand has improved its standout qualities with each new model. As such, it’s now as good as it’s ever been and represents an entertaining family car for anyone who wants to get out and about with a smile. OSV takes a closer look at what it’s all about with our MINI Hatchback review. The new MINI Hatchback is just as fun on the road as it’s ever been, but it now has the added bonus of feeling more grown up. Usable and comfortable, it’s growing into the quintessential hatchback. If you’re a keen driver, you might want to fork out the extra cash on the Cooper S, as this is when the party really begins. It’s got plenty of power and is agile and nimble to dart around roads without any hassle at all. 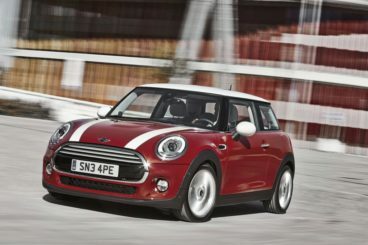 The steering is as instantly responsive as ever, which is classically MINI. However, it isn’t something that is widely praised, you will definitely want to try before you buy. While no car in this sector can beat the Ford Fiesta when it comes to driving fun, mostly everyone will derive a lot of pleasure from driving around in this MINI Hatchback. There is a trio of petrol engines to choose from, as well as a pair of diesels. The petrol range kicks off with a small 1.2-litre three pot turbo that can deliver up to 100bhp, while the Cooper is pulled nicely along by a 1.5-litre three pot engine that has 134bhp. The star is the Cooper S, which is powered by a 2.0-litre four pot unit. It’s an urgent engine that delivers up to 189bhp and can rocket you from rest to 62mph in just 6.8 seconds. It’s a sharp engine that offers lots of grip and accurate steering, but it never feels particularly comfortable. The engine range is rounded off by a 1.5-litre and a 2.0-litre diesel. The former is available in either 94 or 115bhp. Neither is as smooth as the petrol engines, but they’re significantly cheaper to run. The 2.0-litre power plant, meanwhile, is the quickest of them all. 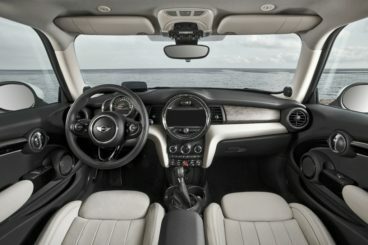 If there was one criticism people have had of the MINI Hatchback in the past, it is that its interiors have always been too immature to fully deal with the everyday demands of a family. Now, though, the cabin has come of age. Everything is well laid-out and feels built to last. The layout is familiar, but it’s got a bit more style about it this time around. There is more quality and we like the fact that MINI have introduced an infotainment screen, to replace the central speedometer which was always too big. It’s a snazzy screen that’s lit up by coloured LED lights in what is a great touch. Ambient lighting, which comes as standard on some models, also adds a touch of sophistication to what was always a trendy if-at-times dated interior. MINI knew they had to do some work on the practicality front, as this has always been a bugbear. It’s still not fantastically practical though and some of the old issues remain, such as cramped rear seats. However, accessing the rear seats is fairly straightforward, thanks to front seats which fold forward by quite a distance. Visibility is good, too, while children will be comfortable enough in the back seats. There are a number of storage spaces, too, including a “secret” cubbyhole above the dash. On the negative side of things, adults will really struggle in the rear, while the 211-litre boot is just too small. You can fold the rear seats for extra space. Standard equipment across the range is good, with even the basic models getting fog lights, air conditioning, Bluetooth phone connection, alloys and a DAB digital radio. The Cooper doesn’t add a whole lot more, but the Cooper S is an attractive proposition, with its huge exhaust, body-hugging sports seats and a sports steering wheel. You can also get this and the Cooper model in a limited-edition 7 trim level that adds 17” alloys, a 6.5” display screen and dual-zone climate control. The optional extras list is quite extensive, with satellite navigation and leather seats being the most obvious boxes you’d tick. Coloured accents add more style, while a heads-up display is definitely worth a look. Prices for the new car start out from £14,000 and rise to £21,400. If you prefer to lease and would like more information on our leasing deals, you can check our page here. In terms of running costs, the turbocharged 1.2-litre petrol unit represents good value for money and can achieve average fuel economy returns of 61.4mpg, while emitting 108g/km of CO2. The MINI One D diesel is the cheapest to run and it’s good for 83.1mpg. However, thanks to the fun-loving nature of this car, it’ll be practically impossible to achieve those numbers regularly, unless you want to drive like a monk. It’s likely that you will instead average returns of 65mpg, which is still very good. The One and the Cooper models are also cheap to run. The feisty Cooper S, meanwhile, averages fuel economy returns of 49.8mpg, and emit 133g/km of CO2. The car is surprisingly expensive to insure, with the entry level model sitting in group 17. The Cooper S, meanwhile, occupies group 28. Let’s see how the car fares against its rivals in the comparison section of our MINI Hatchback review. 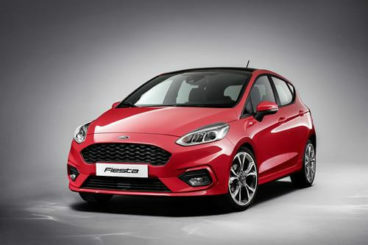 The new Ford Fiesta Hatchback has never looked racier. Looking as though it’s got a bit of the devil in it, it’s just as fun to drive as it’s ever been, while its low running costs are deliciously tempting. There’s really no other car in this market that can match the Fiesta when it comes to pure on-the-road entertainment. The direct steering plants you firmly on the road whilst being nimble and agile. The MINI offers a good driving experience too, but it can’t match the Fiesta. The only criticism is that it isn’t as quiet or as composed as it could be. The 1.25-litre and 1.6-litre petrol engines are probably best avoided, as they now look and sound as dated as they are. The 58bhp version of the 1.25-litre is so underwhelming that it takes 16.9 seconds to cover the 0-62mph “dash”. The 1.0-litre EcoBoost petrol engines are much more impressive, in both 98bhp and 123bhp guise. They’re small, but Ford has packed them with enough power to get you from rest to 62mph in 11.2 and 9.4 seconds respectively. Only one diesel engine is available – 1.5-litre TCDi unit that comes in either 93 or 72bhp guise, with the former doing 0-62mph in 10.9 seconds. These diesels are your best bet if keeping running costs down is one of your main priorities, as they average fuel economy returns of 88mpg. However, they cost more to buy outright than the 1.0-litre EcoBoost petrol engine, which will save you money in the long run if you use your car primarily for shorter journeys. The interior is comfortable and made from largely high-quality materials. Customisation options are good and if you add the right tech you can create a big car feel. Visibility is good thanks to an adjustable steering wheel and driver’s seat, while the cabin is just as boldly designed as the exterior. The sweeping dash looks the business, soft-touch plastics abound, while the brand’s SYNC system is an option worth snapping up. Like the MINI, the Ford isn’t all that practical. It has a much bigger boot, which measures 290-litres, but in terms of all-round space, it falls way short when compared to other cars in this sector, such as the Kia Rio. Its compact dimensions might not prove their worth in terms of rear seat space, but they do when it comes time to park. There is a five-door model available for a bit more versatility, while there are lots of handy storage spaces dotted around the cabin. The new Volkswagen Polo Hatchback is spacious, calm and composed on the road and boasts a top quality interior. The MINI is more fun to drive than the 2016 Volkswagen Polo, which the brand have made quiet and comfortable. It’s perfectly capable on straight roads, but take it down a winding lane and it shows its weaknesses. For example, the light steering is a bit of a problem, while the soft suspension leads to too much body lean when you tackle bends. Overall, it’s a composed and measured drive, but one which is wholly uninspiring. The engine range kicks off with a basic 1.0-litre petrol that is worth overlooking. It takes 16.5 seconds to do 0-62mph and as such won’t be of any help whenever you want to overtake dwindling traffic. A 75bhp version of the 1.0-litre petrol does 0-62mph two seconds quicker, while a turbocharged version does it in 9.3 seconds while delivering 108bhp. A 1.4-litre turbocharged BlueGT model, meanwhile, is able to get you from rest to 62mph in 7.8 seconds. There is only one diesel engine in the range, and it takes 12.9 seconds to cover the 0-62mph dash. However, its fuel economy is excellent, and in 74bhp guise, it’s capable of returning 83.2mpg. The smallest petrol in the range is the 59bhp 1.0-litre unit, which averages returns of 60.1mpg. 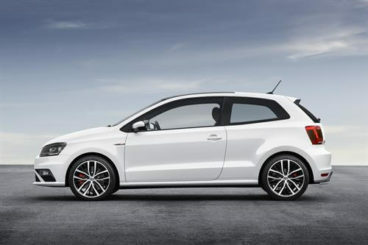 The turbocharged 1.0-litre TSI engine is good for 65.7mpg. It’s impressive. The Volkswagen Polo Hatchback leaves a strong impression. High-quality materials are everywhere and its big car comfort elevates above the 2016 MINI Hatchback. The design is on the conservative side of things, but it’s polished, slick and clean. Moreover, the dash is super user-friendly: The dials are easy to reach, read and use, whilst everything is clearly laid out. The Polo also scores highly on practicality. The interior is roomy, with head and legroom good in both the three and five-door models, while the 280-litre boot is significantly bigger than the one in the MINI. When choosing the MINI over some of its rivals, you have to decide what your priorities are. Do you want a trendy, fun-loving hatchback that makes driving a synch, or do you want something more practical and conservative that would probably be able to deal with the everyday demands of a family better? The MINI Hatchback isn’t entirely impractical and its sense of devilment will certainly appeal to anyone who wants a family car that is stylish, agile and still very comfortable.